1. Place the tortillas on a work surface and spread each with cream cheese. Arrange spinach leaves over 2/3 of the cream cheese leaving the bottom 1/3 with cream cheese only. Top spinach with canadian bacon, plum tomatoes, avocado and crumpled bacon in that order. 2. 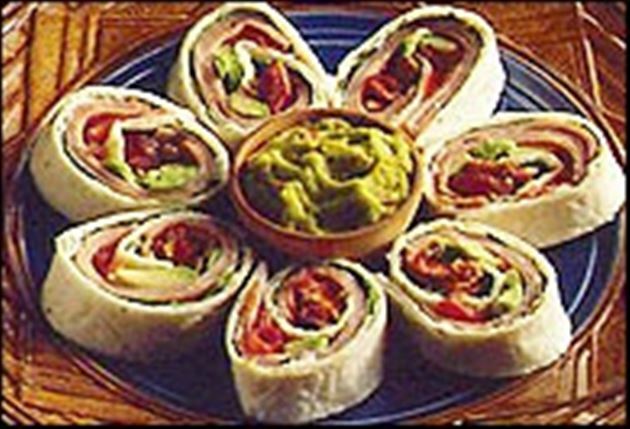 Beginning with the end covered with filling, roll the tortilla into a tight roll toward the end covered with cream cheese only. 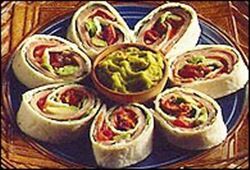 Cut rolls into six 1-inch thick slices for snacks or in halves for lunch. Enjoy this B L T Burrito delicious Mexican recipe!